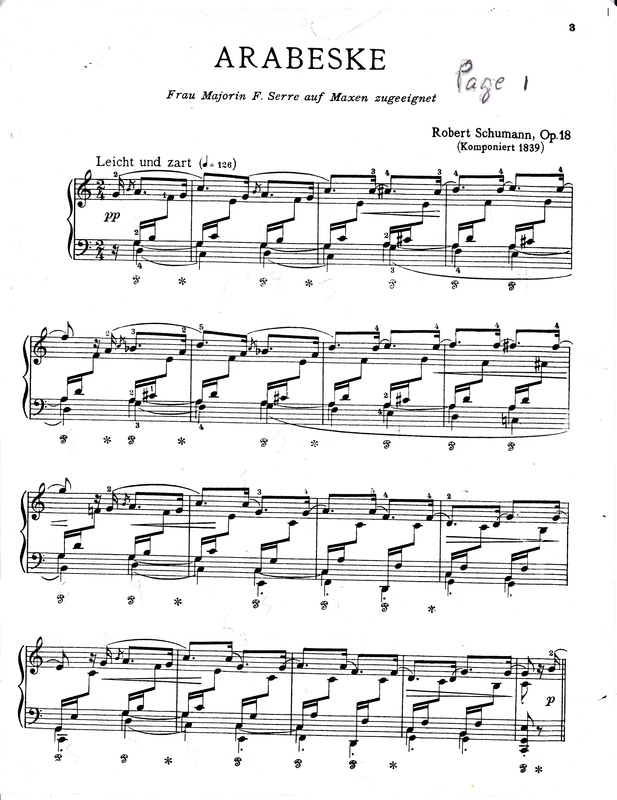 The Schumann Arabesque is a heartfelt character piece from the Romantic era. It requires the player to have a very supple wrist to realize the lilt of buoyant, legato dotted eighth/16th figures that permeate the music. Though the composition is in C Major, it has interludes in the minor, that are somber and impassioned. I chose to flesh out the opening section of the Arabesque for my current instruction. And in keeping with my assertion that learning should begin with baby steps, I isolated each of 4 voices, individually playing and contouring them. When I next identified the tenor, then alto voice, I gave myself the opportunity to combine the alto (and tenor, which was double stemmed) with the soprano. I then played bass and soprano lines together. This specific undertaking was a challenge because the alto figure along with tenor doubled notes could not overshadow the soprano line. The thumb also needed to be subdued so it wouldn’t intrude upon the uppermost voice that contained a very fluid melody. The bass provided the underpinning for the composition, and was learned as thoroughly as the other voices. Combining the bass with the tenor/alto voices, or separately playing this line with the soprano was an important ingredient of thoughtful practicing. Putting all voices together with sensitivity to the balance between them, provided the necessary foundation for the piece to grow and develop. Adding pedal was the final touch giving the composition nuance and polish.